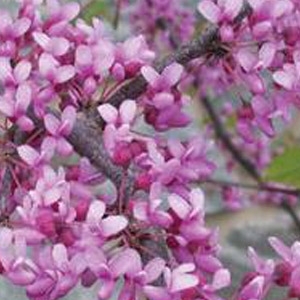 The Eastern Redbud has rosy pink flowers that appear in April before its leaves appear. Heart-shaped leaves change from dark green, to yellow in the fall. The Eastern Redbud forms a spreading, graceful crown and grows in full sun or light shade, but prefers partial shade in windy, dry areas. Deciduous.